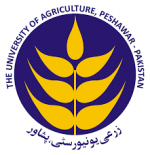 1Department of Plant Breeding and Genetics, Ghazi University Dera Ghazi Khan, Punjab, Pakistan; 2Department of Agriculture Extension Education and Communication, The University of Agriculture, Peshawar, Khyber Pakhtunkhwa, Pakistan. Cotton is an important commodity that runs the textile industry of Pakistan. 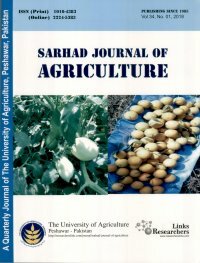 Under the present scenarios of climate change and water security cotton production is under threat so, it is imperative for plant breeders to develop cotton lines that can grow on minimum water availability. In this study performance of 23 cotton genotypes was compared for seed cotton yield and fiber quality traits under water stress and non-stress conditions. All the genotypes depicted significant differences for days to first square formation, days to first flower formation, plant height, monopodial branches per plant, sympodial branches per plant, number of bolls per plant, boll weight, fiber length, fiber strength, uniformity index, fiber fineness, ginning out turn and seed cotton yield per plant in both watering treatments. Water stress on an average, caused a reduction of 13% in days to first square formation, 14% in days to first flower formation, 19% in plant height, 18% in monopodial branches, 26% in sympodial branches, 27% in number of bolls per plant, 14% in boll weight, 4% in ginning out turn and 37% in seed cotton yield. GeFH-326 showed better performance for sympodial branches, bolls per plant, fibre strength and seed cotton yield under water stress and non-stress conditions. 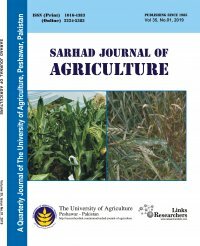 Sitara-15 recorded higher number of bolls formed, fibre length, fibre strength and seed cotton yield under moisture stress and NIAB-1048 and Zakaria-1 attained higher sympodial branches, maximum bolls per plant, fiber length, GOT and seed cotton yield per plant under non-stress treatment.